Home > News > Dubbs Beck works complete! After nearly three years, a project at Dubbs Beck has now come to a close. In partnership with the Environment Agency, Natural England, Biffa Award and the EU LIFE IP ‘Natural Course’ project, this project aimed to re-naturalise a section of the beck, a tributary of the River Gowan, that can be found in the Kent catchment. The project focused on a straightened section with embankment, that stretched for 375 metres along the mid section of the beck. Removing the revetment allowed for flow diversity and promotion of the regeneration of habitats, as well as promoting erosion and deposition of sediments. Fencing was added to prevent bank erosion and ensure livestock management. At the end of last year, some of the final stages of the Dubbs beck project were completed. 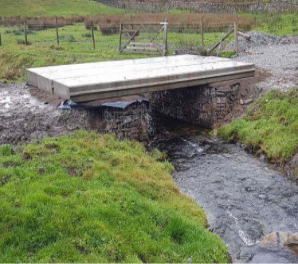 This stage involved the installation of an agricultural bridge across the beck to replace the bridge present before the habitat improvement work was completed. 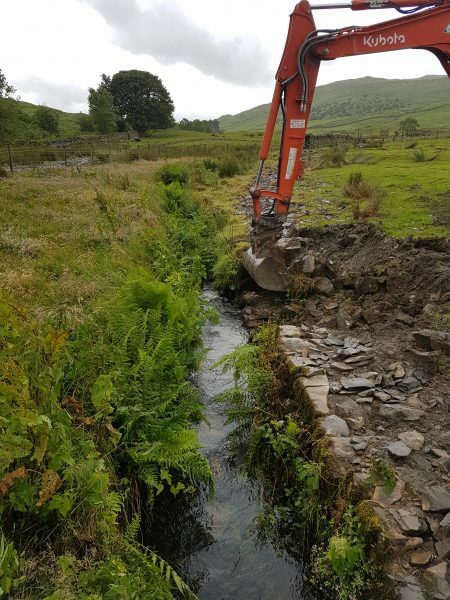 This was because after the revetment removal, the beck was considerably wider and in order for the beck to function naturally, the existing structure needed removing as to avoid the old structure becoming a pinch point that would effect the flow of the water. Additional fencing and guardrails were then was added. Last year a team of volunteers planted large trees upstream and yesterday, volunteers and SCRT staff planted 75 additional trees, within the fenced zone. Once grown, the trees will provide a habitat far many other creatures in the future.